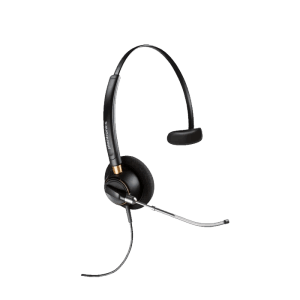 Corded Headsets - Headsets Direct, Inc. If you’re like most other companies and government agencies, you’re always looking to improve productivity and create a healthier work environment. 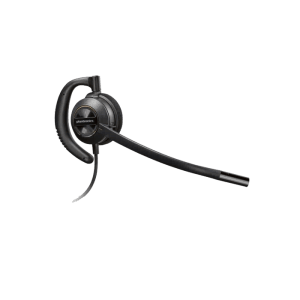 With Plantronics and Jabra corded headsets, you’re able to write and type hands-free and to avoid causing neck and shoulder strain caused by cradling your handset against your shoulder. With business-grade products, you will find long-term value and benefits that far exceed your initial investment. 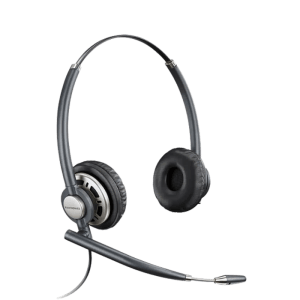 When considering a corded headset, you need to choose a wearing style that best fits your personal preference (over the head or over the ear), but also one that suits your environment (background noise levels). 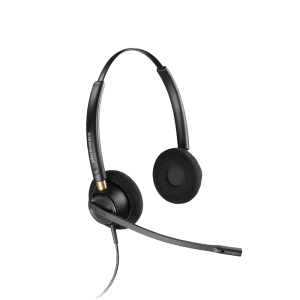 Noise-canceling headsets use multiple microphones to isolate and reduce your background noise, making it easier for your caller to hear your voice. 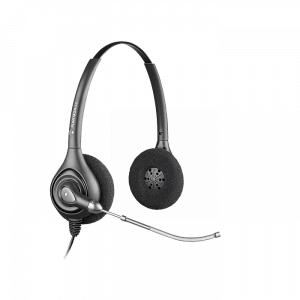 If you struggle to hear your caller, consider an over-the-head binaural model that covers both ears. 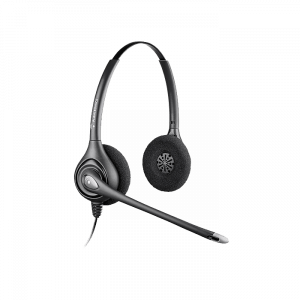 This reduces distracting noise and conversations from your office and lets you focus on your caller. 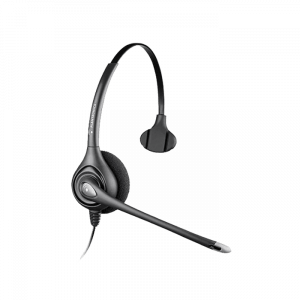 Users that interact with customers face to face tend to choose a low-profile model that fits discreetly over the ear, making it practically invisible. 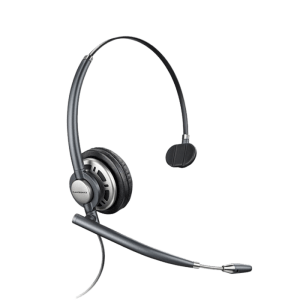 When buying a Plantronics or Jabra corded headset, it’s critical to understand it does not plug directly into your telephone. 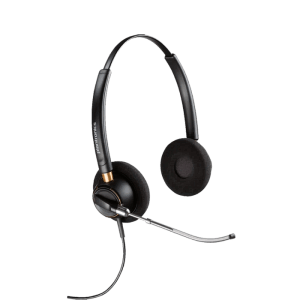 You will also need to purchase a bottom cable or amplifier that is compatible with your telephone, computer, or mobile phone. 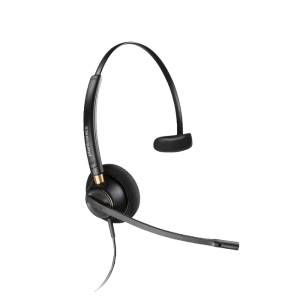 This allows any headset to be used in any application, but you will need to consult a compatibility guide or headset expert to determine the correct amplifier or direct-connect cable. 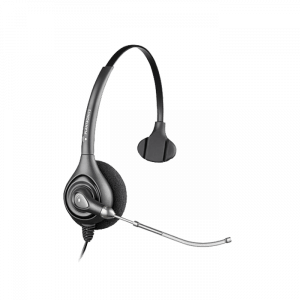 Which is better for corded headsets…a bottom cable or amplifier? This question comes up regularly, and the answer depends on your budget and the audio quality you want to have. 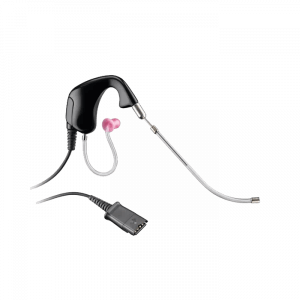 When you check compatibility, many newer phones will allow a bottom cable or amplifier. The bottom cable takes up zero desk space and will cost half the price of a headset amplifier. The negative of the cable is you lose the ability to control your voice volume on most phones (phones typically have speaker volume only). With an amplifier, it takes up a little space on your desk and costs more. 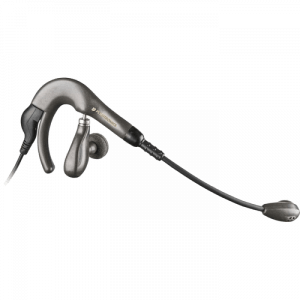 The advantage is it will give you volume controls for your speaker and microphone. An amplifier will also give you the best possible sound quality, so if you can afford it and want the best, get the amplifier. 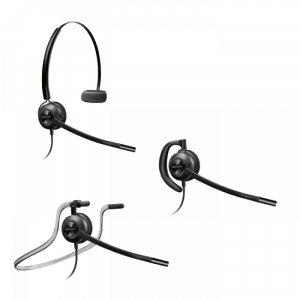 Call our headset experts or use our compatibility guides to determine your amplifier and cable options.